Anybody else have this? My window rattles and makes a noise when I close the door with the window only partly up or down. I can't stand this noise but when I took the door panel off it was hard to see anything that could cause this. Anyone know what could be the cause? Something I could tighten or replace? I couldn't find the window "guide" either. I know it is probably worn out because when I had tint there was a streak where this thing was touching the window. Any help on these two issues would be great! I know someone on this board or RegalGS posted about this area. I just don't want to take the door panel off again w/o knowing what to look for. Something needs to be tightened or possibly replaced but I don't know what. I think my driver's window was replaced at one point. Besides the squealing thing when I close the door the window is poped out at the top. Everytime I leave the car I push it at the top gently and it snuggly fits into place. When I was cleaning the plastic pieces at the end of the seat rails on the driver's side I found a small shard of glass same greenish color as the Riv's tint. Hmmm. Troy - my window had the same problem as yours when I bought my Riviera - rattles, and mine stuck out ~ 1/4" from the B pillar. It ended up being a pair of broken window guides - not the felt ones along the top lip of the door like you speak of - but the heavy duty nylon-reinforced ones inside the door. (These are the ones that the window glass is bolted to.) One of my guides had the nylon tab broken off of it and the metal inner support was rattling against the window track. Even if the tab isn't gone, if the nylon breaks the inner support can start to bend away from the track and a rattle can develop. Check this out next time you have the door panel off. 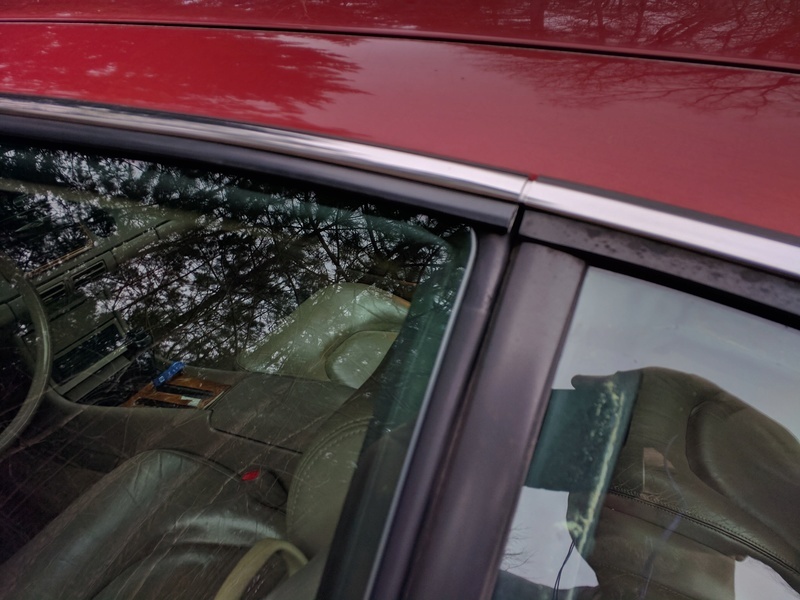 This was not an easy fix, but it was a very annoying situation, so I ended up buying an entire driver's door and pulled the entire window track out of it as a replacement. The nylon pieces are integrated into the window track mechanism, so if they are broken, it's gonna cost you, but if you are handy with a drill and a rivet gun, the entire window track replacement procedure can be done in 2 hours time. Good Luck! One of my guides had the nylon tab broken off of it and the metal inner support was rattling against the window track. Even if the tab isn't gone, if the nylon breaks the inner support can start to bend away from the track and a rattle can develop. Do you know why, or have a suspicion why this happened? Nylon tab fatique. Pressure from the window against the seal when closed? I'm gonna venture a guess and say it's because a lot of people - including some of my passengers - close the door using the window because they are used to doors with an integrated B-pillar. Those little steel tabs on the window track just can't handle the force of the repeated closings, and eventually they bend enough to break the nylon. I take care to remind my regular passengers to close the door USING THE DOOR. Interesting. In the motorcycle world, and even for those obsolete motorcycles, and motorcycle parts, there always seems to be someone or a group who comes up with a solution and then offers it to the group. It would be neat to see that happen here. By solution I mean an actual part to fix the problem. the situation Nicholas mentions sounds similar to the problems with the B-body window guides. If it is, in fact, just the stupid nylon guides (look like a small nylon doughnut, sometimes like a torpedo) that break, you can replace just that part. Bend out the stops at one end of the channel and tap out the old/broken guides and replace with new roller guides. Any part numbers with pics? I guess these are the parts Nick was referring to... If so I misunderstood his post and the guides I was referring to will be of no use. I have the issue described in this thread. I realize its 10+ yrs old, but am wondering if Nicholas is still an active member and can provide the part# he is referring to. Or maybe, another member has tackled this issue and knows what part# to replace. 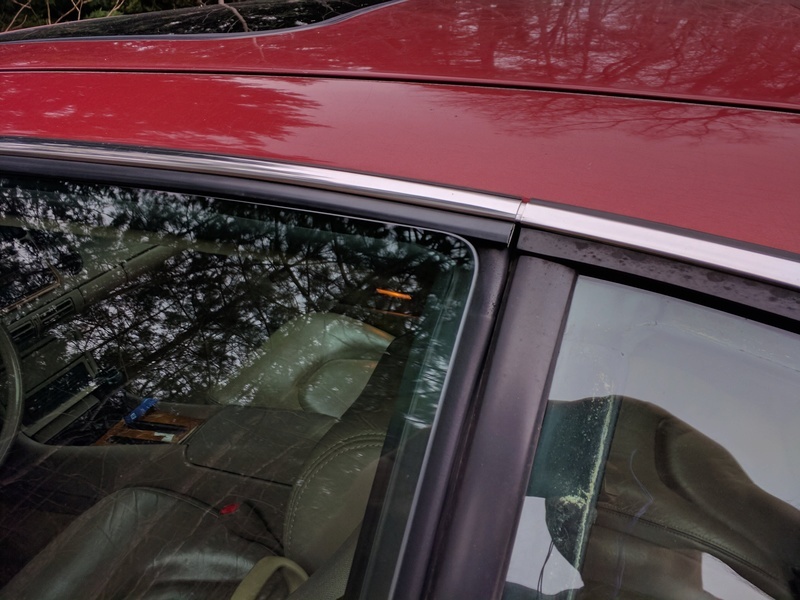 My DS window does not match the door seal mating surface when I close the door, it lays on top of the rubber drip edge underneath the chrome piece on roof. see photos showing correct and incorrect window mating arrangement. Check the FSM, you likely can adjust the window so it is properly aligned. Has anyone made this spot weld repair before? Has anybody tried taking both driver and passenger doors apart and compare to try and find the problem? Both of my Rivs have (and have had) the window rattle on the driver side, and the passenger side is perfect. The rattle never really bothered me. I just blip the window up or down until it stops. It seems to be at a very distinct location that it rattles. I know the little knobs that help hold that behemoth of a window in place are worn out. You can clearly see in my window tint where they contact the glass. My car does the same thing.